To review the details of the current cycle project proposals - On menu to the left -� click Current Proposals (need Adobe PDF reader to see the complete files). Virginia Fisherman Identification Program (FIP) (http://www.mrc.virginia.gov/FIP). Click link to register or to find out if you are exempt. 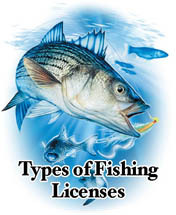 If you have purchased a VA Class A Fishing Guide License and want to fish in the Maryland saltwater areas, you must also apply for a free MD Fishing Guide Reciprocity Permit. The application form may be download from this MD DNR website link. VIMS, striped bass tagging study on mycobacteriosis (need Adobe PDF reader to see the reward poster). Read for more details.. Practice Careful Catch - Some tips from CBF on how to handle fish. For complete fee listing refer to this web page: MRC License fees. - For a complete list of all license fees (commercial and recreational). Delaware: License fees. DE Fisherman Information Network (FIN number) as of 1/1/09. Maryland: License fees. MD Saltwater Angler Registry as of 1/1/11. Potomac River (PRFC): License fees. See MD Registry and/or VA Registry (FIP) as of 1/1/11. Washington DC: License fees. National Saltwater Angler Registry as of 1/1/11.